States and cities across the United States are increasing minimum wages within their jurisdictions, sparking other policymakers around the nation and on Capitol Hill to consider whether these changes affect the wages of all workers—not just those at the very bottom of the hourly pay scale who immediately benefit from a higher minimum wage. 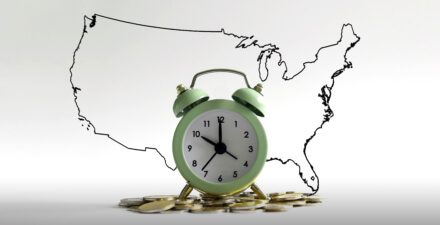 This question is especially timely this year, as 19 states have already increased the minimum hourly wage. And many cities are also boosting low-income workers’ pay, among them Oakland, CA, which increased its minimum wage to $12.25 an hour, and Seattle, WA, which now requires large employers to pay at least $11.00 an hour. So how will these boosts in pay across the nation affect workers? In addition to minimum wage workers who receive a direct increase, which portions of the workforce receive indirect raises from a minimum wage increase? When our nation’s capital, Washington, DC, raises its minimum wage in July to $10.50, how will that affect the wages of workers who already earn $11.50? This question is important for gathering a more complete understanding of the effects of raising the minimum wage beyond the lowest-paid workers. This issue brief explores the available economic research on these ripple effects, finding that increases in the minimum wage do raise the wages of those earning above the minimum wage. 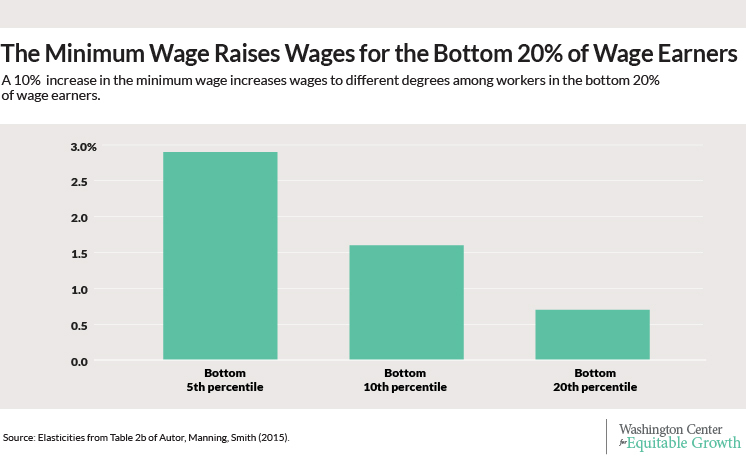 These ripple effects are critical to reducing wage inequality between those earning low- and middle-class wages. Although the minimum wages enhances the bargaining power of many low-wage workers, an increased minimum wage’s effectiveness in doing so dissipates as it spreads across the wage spectrum, essentially disappearing for middle-class wage earners. At the same time, assessing the exact impact of raising the minimum wage on specific earners may require higher-quality hourly wage data on all workers than is currently available in standard household surveys in the United States. What are minimum wage ripple effects and how do they occur? In a recent study, Arindrajit Dube of the University of Massachusetts-Amherst, Laura Giuliano of the University of Miami, and Jonathan Leonard of the University of California-Berkeley find substantial evidence of a ripple effect in a large U.S. retailer’s pay policies. In 1996 and 1997, the federal government raised the minimum wage of $4.25 an hour in two steps to $4.75 and $5.15. The authors find that the large retail company, which was promised anonymity in order to provide data for study, raised its wages by 30 to 40 percent across its entire hourly workforce even though only 5 to 10 percent of this national firm’s employees earned less than the minimum wage. There are good reasons to expect to see this same kind of ripple effect of raising the minimum wage more broadly in the U.S. labor market. In particular, economic theory suggests that increasing the minimum wage will raise the wages of other workers when employers need to compete for workers, as in some search-and-matching models of the labor market. Imagine all firms occupy rungs on a ladder, ranked by how well they pay their workers. After a minimum wage increase, the lowest paying firms raise their wage to the new minimum. This leads the next rungs of higher-paying firms to raise wages as well—to increase their ability to recruit and retain workers who would have better options elsewhere due to the minimum wage increase. The minimum wage then filters its way up the labor market, with ripple effects declining in influence further up the ladder. Alternatively, workers may care about how they are paid relative to other workers at in their own workplace. After a minimum wage increase, will a supervisor be content with a wage similar to her now more highly paid staff? To the extent that employees are concerned about relative wages within a business, firms may raise wages in accordance with their institutional norms. Whether ripple effects are largely market-mediated across firms or are instead based on relative pay concerns within the firm are open questions that get to the heart of wage-setting mechanisms in the labor market. The research by Dube, Giuliano, and Leonard on the large U.S. retailer suggests that within-firm pay concerns may matter a great deal because they affect how employees search for jobs. The retail industry famously boasts a high rate of employee turnover, and the authors find that workers quit their job significantly less often after minimum wage increases. This effect, however, largely occurs through relative pay concerns, such as when a worker receives a pay raise relative to her peers, she is far less likely to quit than if she had not received that relative increase in pay. In addition to this one case study, economists find general evidence of these kinds of ripple effects from raising the U.S. minimum wage. The best estimates, though, appear in research conducted by economists David Autor of the Massachusetts Institute of Technology, Alan Manning of the London School of Economics, and Christopher Smith of the Federal Reserve Board. They study all state and federal minimum wage increases from 1979 through 2012, and measure the effect of the raises at each point of the wage distribution. How do ripple effects affect wage inequality? Because women are generally paid less than men and therefore fall closer to the bottom of the wage spectrum, the minimum wage has larger effects on female wage inequality. For wage inequality among women, Autor, Manning, and Smith find that the minimum wage had particularly strong consequences. 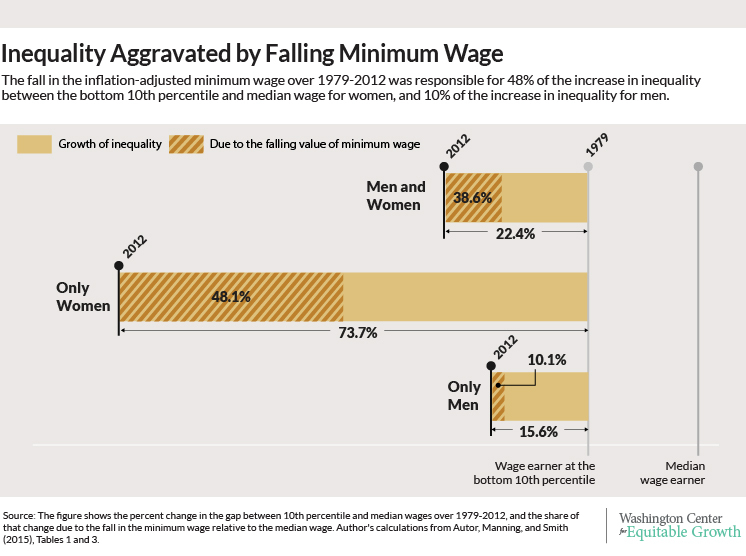 Between 1979 and 2012, the declining minimum wage was responsible for 48 percent of the increase in female wage inequality between the bottom and middle of the wage distribution. (See Figure 2.) This finding highlights that raising minimum wages in general disproportionately affects women. A female employee is more than 60 percent more likely to be a minimum wage worker than a male employee. As significant as these ripple effects seem on their own and for the causes of wage inequality, Autor, Manning, and Smith themselves raise an important concern about these estimates: could the results simply be a product of survey measurement error? 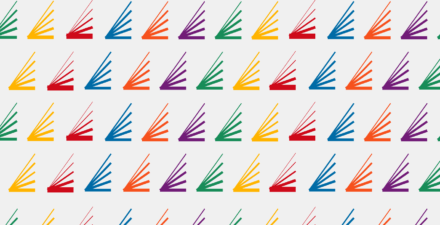 The authors rely on the best available source for U.S. wage data, the Current Population Survey of households, but misreported wage data in this survey poses a problem for distinguishing true ripple effects from fiction. To understand why misreported data may skewer the findings about ripple effects, consider the current minimum wage of $7.25, which is roughly at the 4th percentile of wage earners. If the wage data contain substantial measurement errors, then some of these workers earning the minimum wage may misreport higher wages, perhaps reporting wages up to the 10th percentile. In that case, even if there were no ripple effects, raising the minimum wage above $7.25 will appear in the data as though it increased wages at the 10th percentile, even if that didn’t happen in reality. Although measurement error in the U.S. survey data may complicate estimates of the size of the ripple effects of raising the minimum wage, better quality data suggests these ripples do exist. The recent study of a U.S. retailer by Dube, Giuliano, and Leonard, which used high-quality payroll data, is one case in point. Similarly, using employer-reported data in the United Kingdom that may be more accurate than U.S. household survey data, Richard Dickens of the University of Sussex and Alan Manning and Tim Butcher of the UK Low Pay Commission find that although the minimum wage only affected the bottom 5 percent of the wage distribution, ripple effects extended to the 25th percentile. Both the theoretical and empirical research point to economically meaningful ripple effects from raising the minimum wage, although even the best measurements of the exact size of these effects in the United States are not completely certain. The evidence also seems clear that in the short run, minimum wages do not appear to have ripple effects for those workers earning middle-class wages or higher. In particular, the kinds of changes in the minimum wage that the United States experienced over the past three decades do not seem to affect the median wage or the wages of those at the top. Minimum wages, then, are an important piece of the policy toolkit affecting wage inequality and boosting stagnant wages at the bottom of the wage ladder. Improving middle-class wages will require other strategies.